While not as lavish as Indianapolis' other indoor waterpark -- Caribbean Cove -- this municipal one is more accessible as it is inexpensive and does not require a hotel stay. Adults pay just $4.50. Kids and seniors pay $3.50 and if you show up during the last two hours of the day you get a dollar off discount. 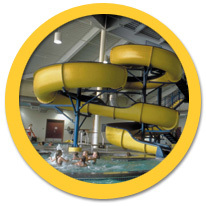 Indy Island Park features a leisure zero-depth pool that maxes out at 3 feet of depth, a water playhouse with a small slide, geysers and spray features, Water slide (must be 48" tall), separate 3-lane swimming pool with lap lanes available and an adults only hot tub.